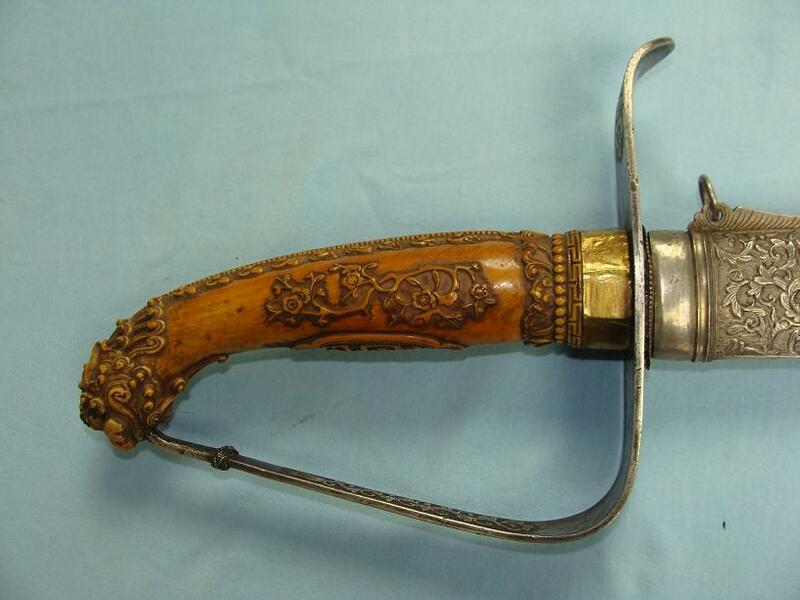 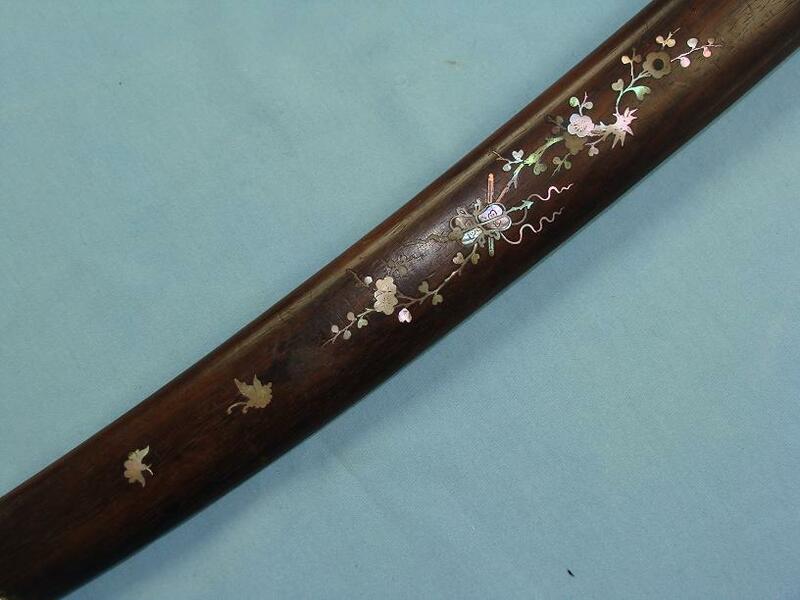 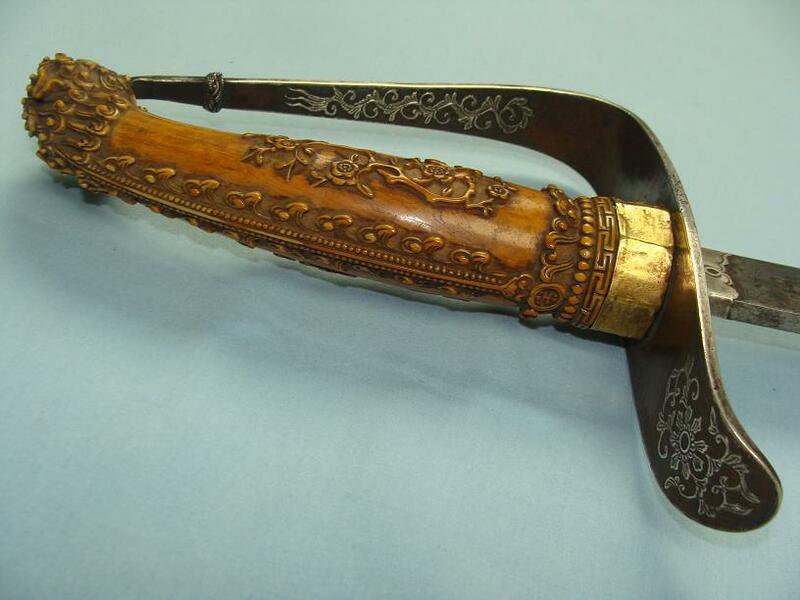 An extremely high quality, full ivory hilted Vietnamese sword. 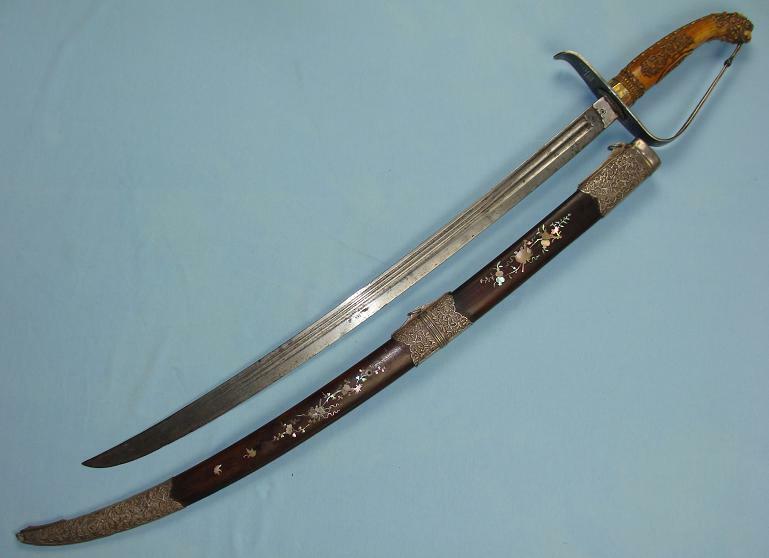 These swords, based on historical images from the late 19th and early 20th century, are typically seen in the hands in the hands of body guards / entourage of Mandarin bureaucrats during the Vietnamese Monarchy. 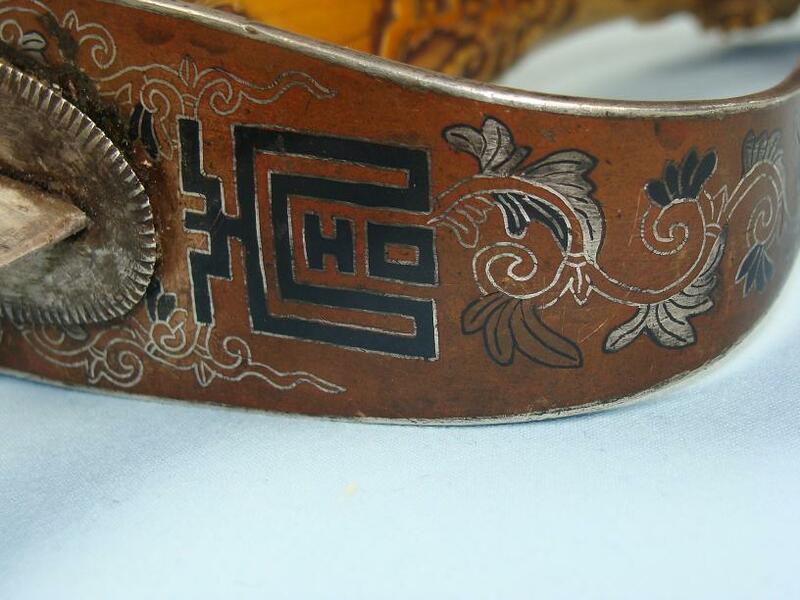 This example shows many aspects not commonly seen on these hand and a half sabres. 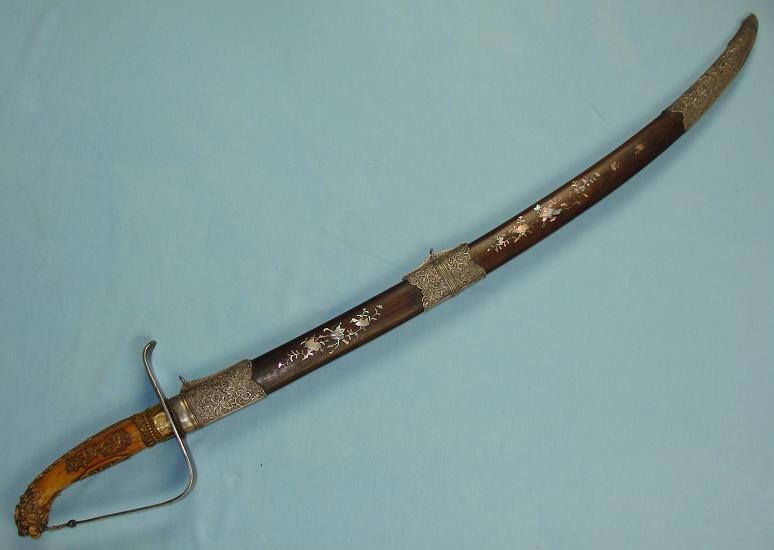 Overall this piece measures just under 94cms in the rose wood scabbard and just under 84cms out. 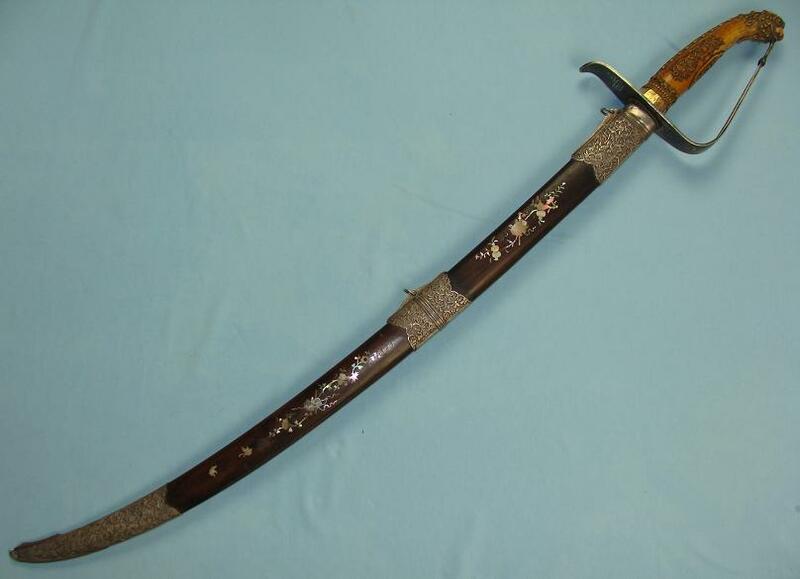 The willow leaf style blade is just over 65cms. 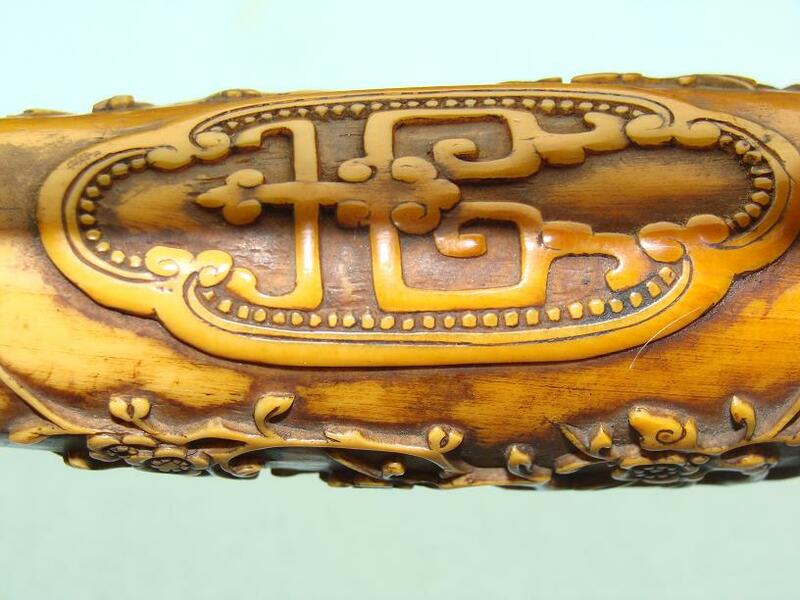 The hilt and pommel are a very finely detailed carved ivory of the highest quality that remain free from losses or damage. 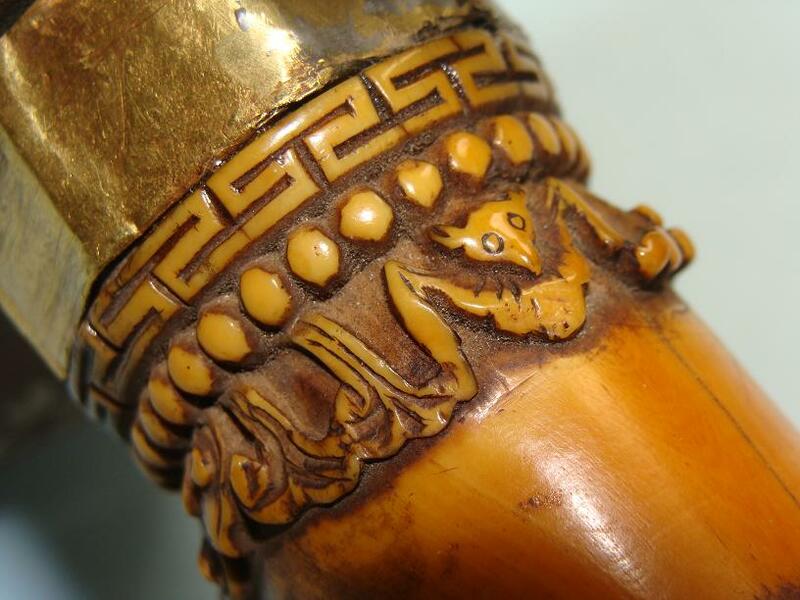 The lavishly carved details are better explained by the images presented. 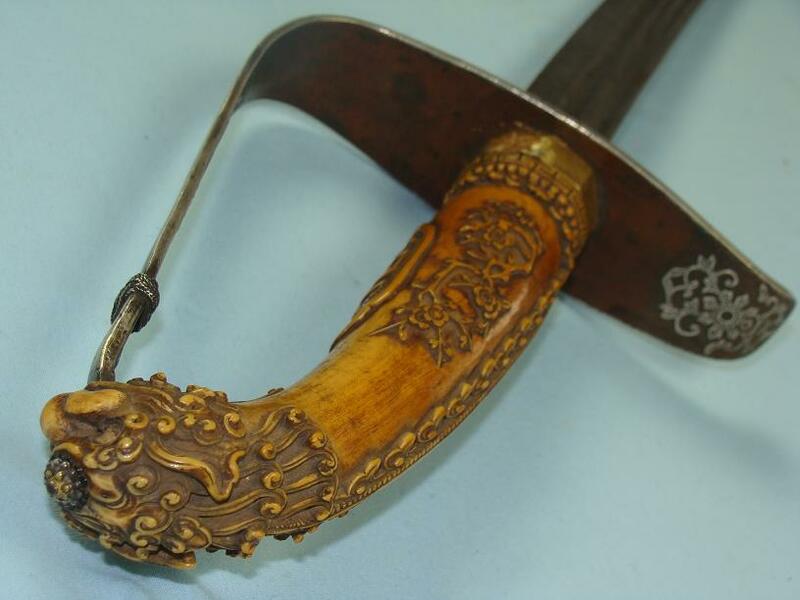 They detailing includes a lion head pommel with flowing mane, branches and flowers, a bat, Chinese motifs including key patterns. 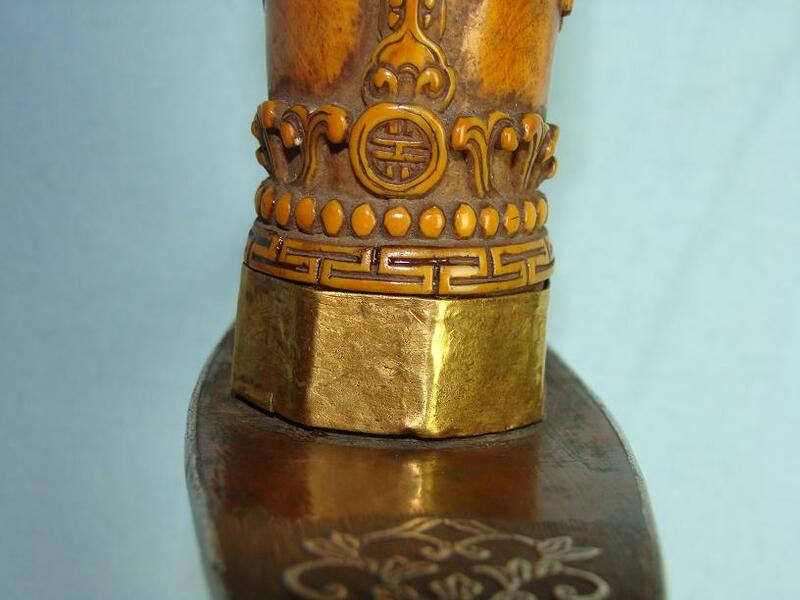 Between the hilt and guard there is an octagonal gold collar. 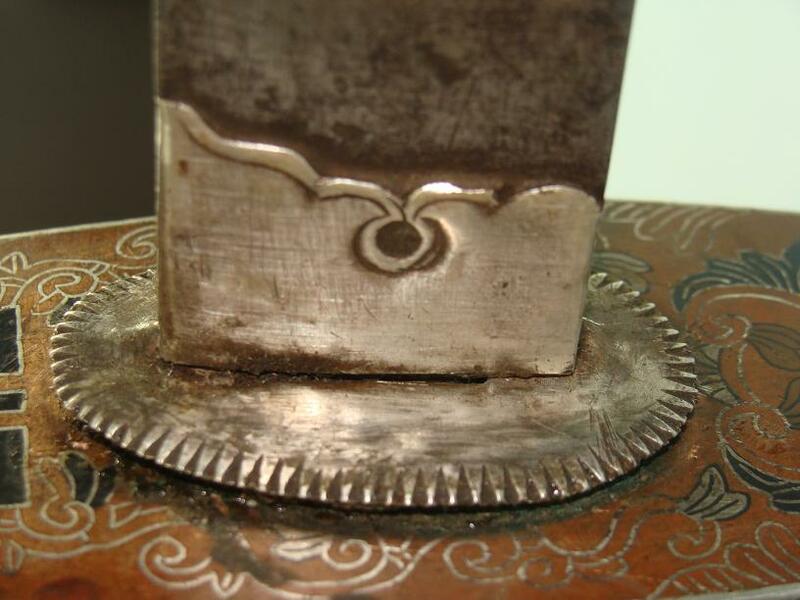 The to pommel tip there is a triple stacked star burst washer arrangement on blued metal, silver and gold that supports the peened tang. 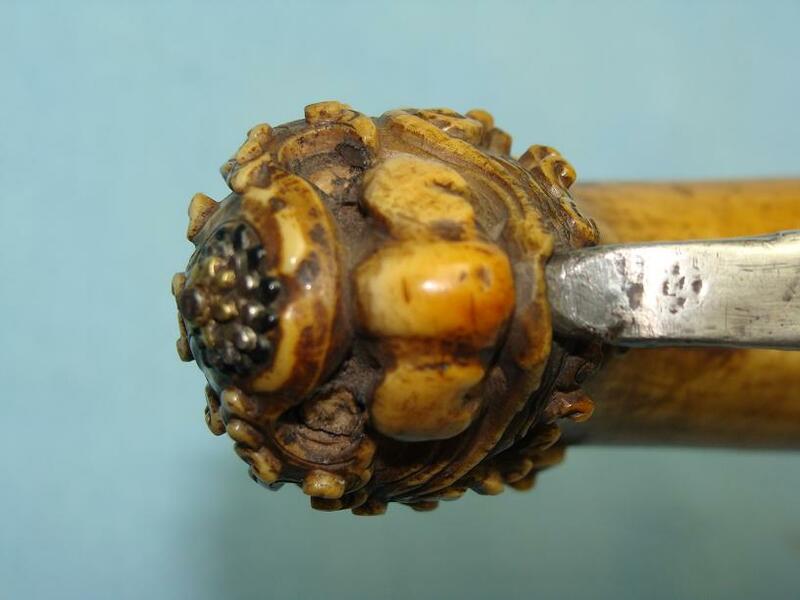 Probably the most unusual and unique aspect of the hilt is the remains of a thin silver surround within the eye sockets that would have once house precious gem stones. 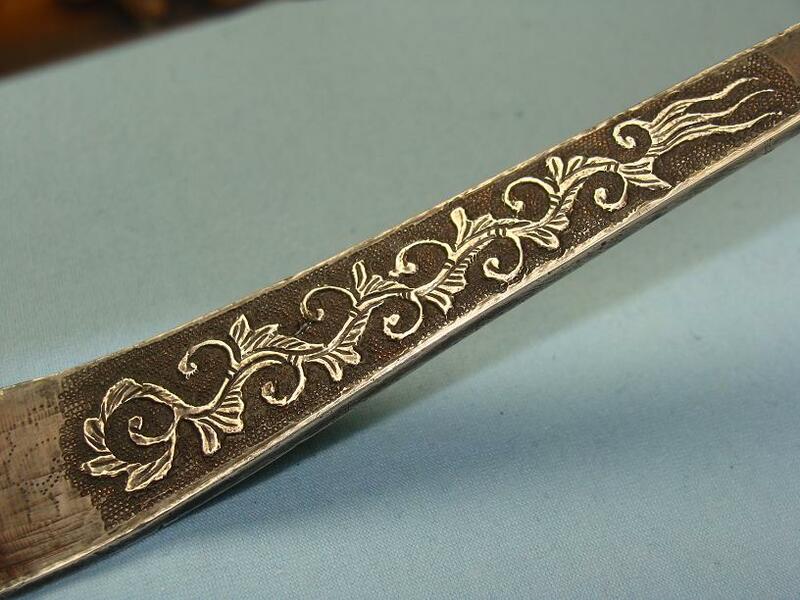 The guard is of a solid silver construction that has been Coppered and Nielloed to the inner and outer surfaces. 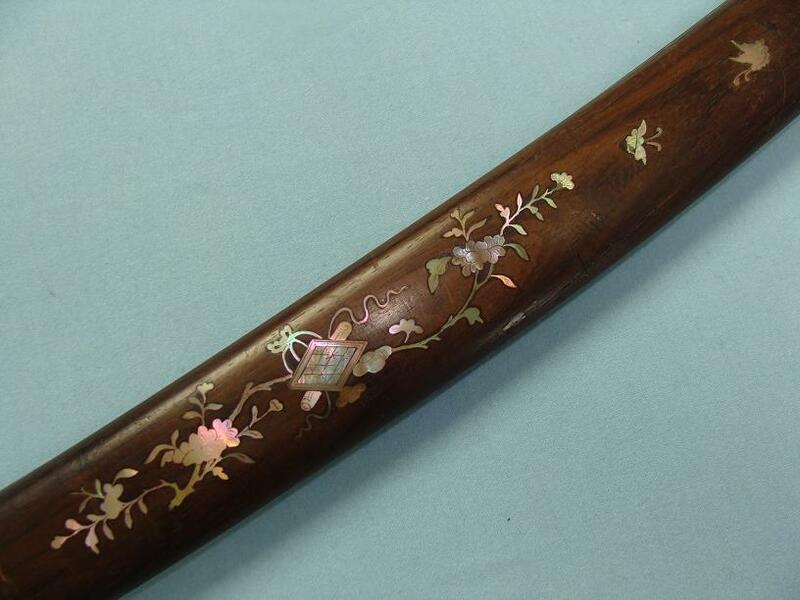 Both floral decorative motifs and Chinese characters are found to the outer surface, whilst the inner surface displays raised/applied vine and floral motifs. 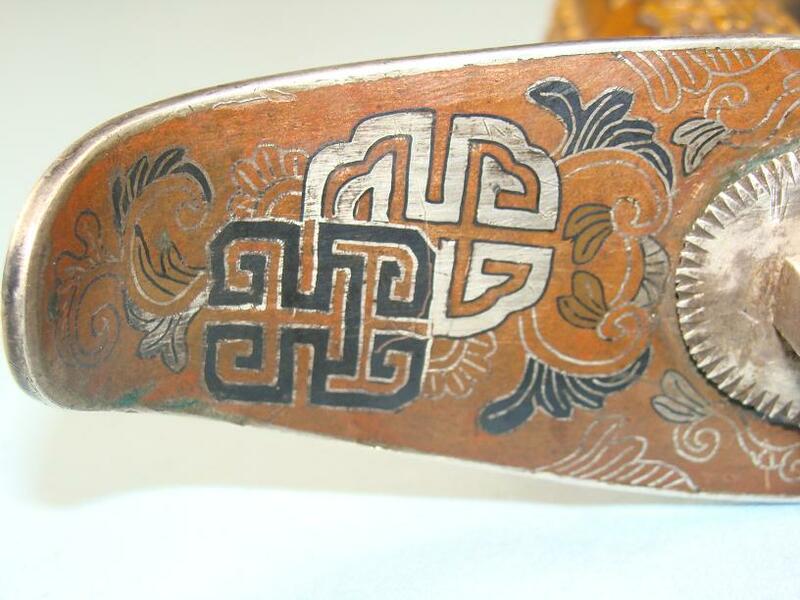 A silver wire endless knot is also found to the guard near the pommel. 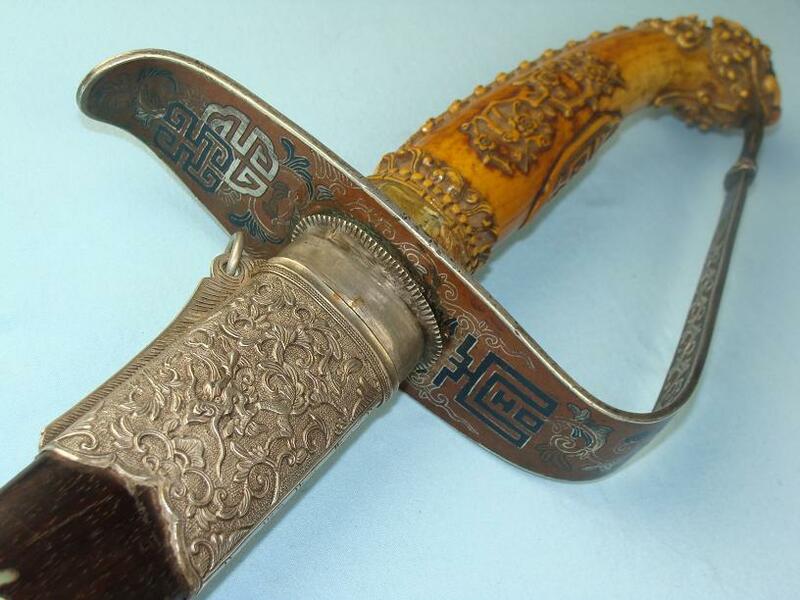 Between the blade and the guard a silver spacer and a silver tonkou is found. 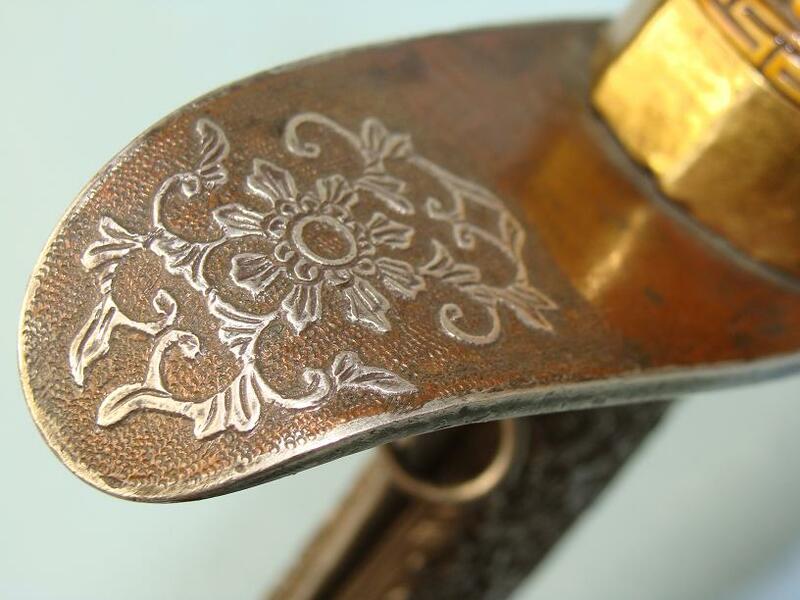 The blade is of pattern welded construction with double fullering that changes to triple fullering on both sides. 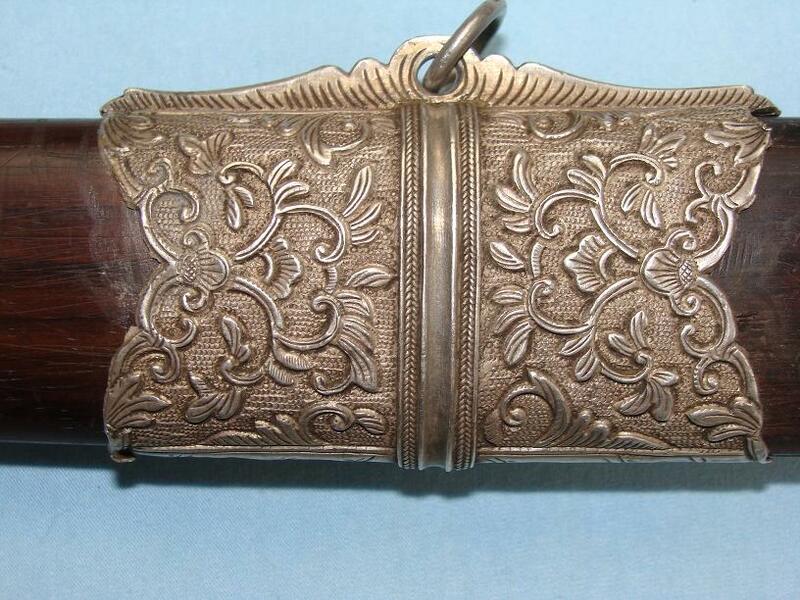 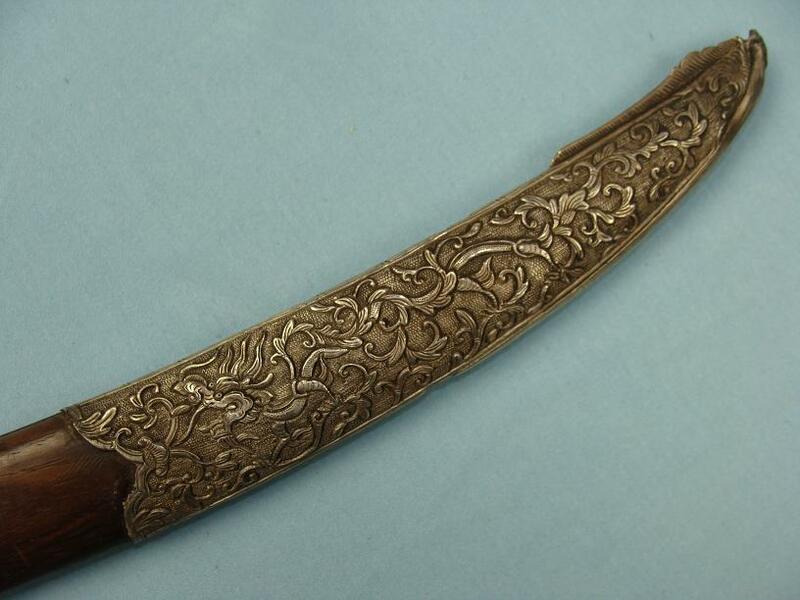 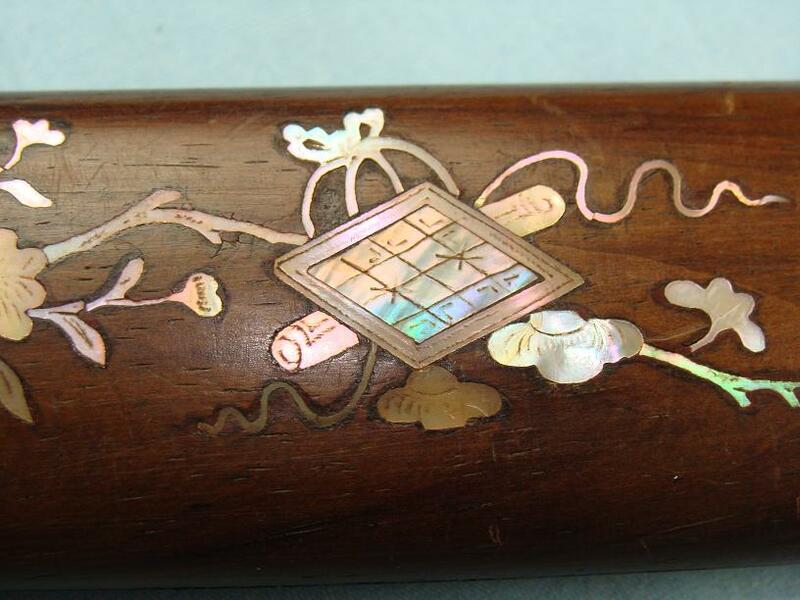 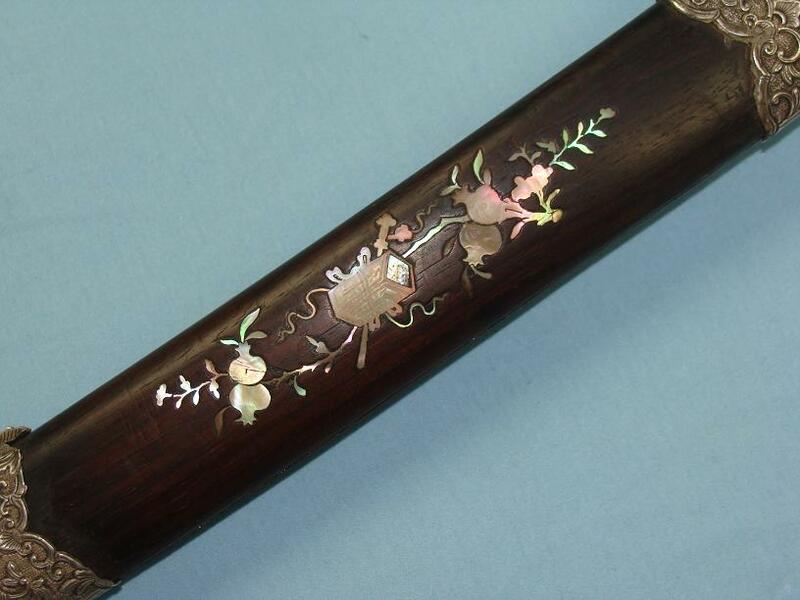 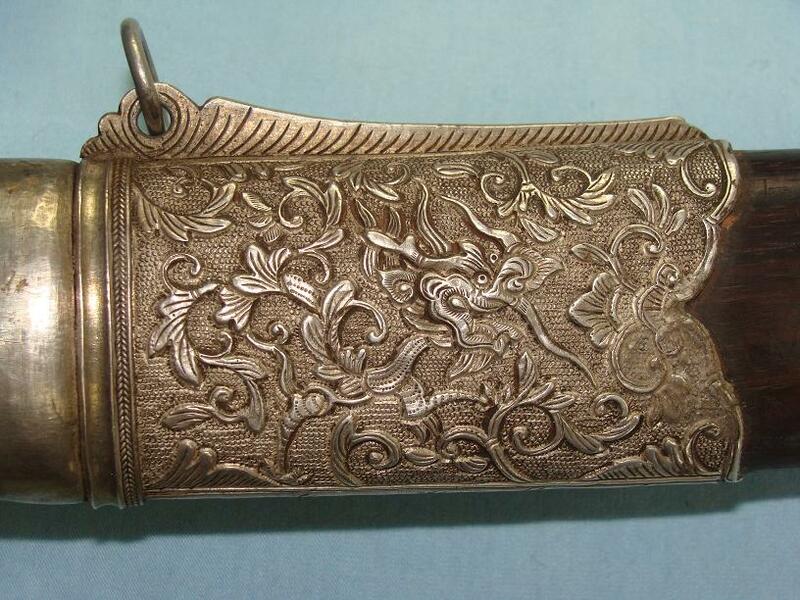 The rose wood scabbard retains the three repousse silver fittings that display dragons with vine and floral designs. 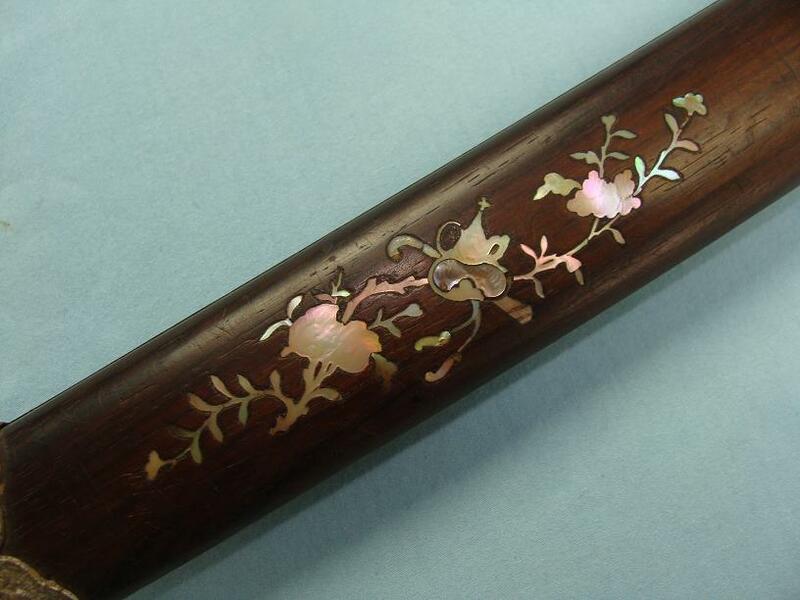 Between the fittings are carved and inlayed sections that display Taoist symbols amongst floral motifs, branches and butterflies. 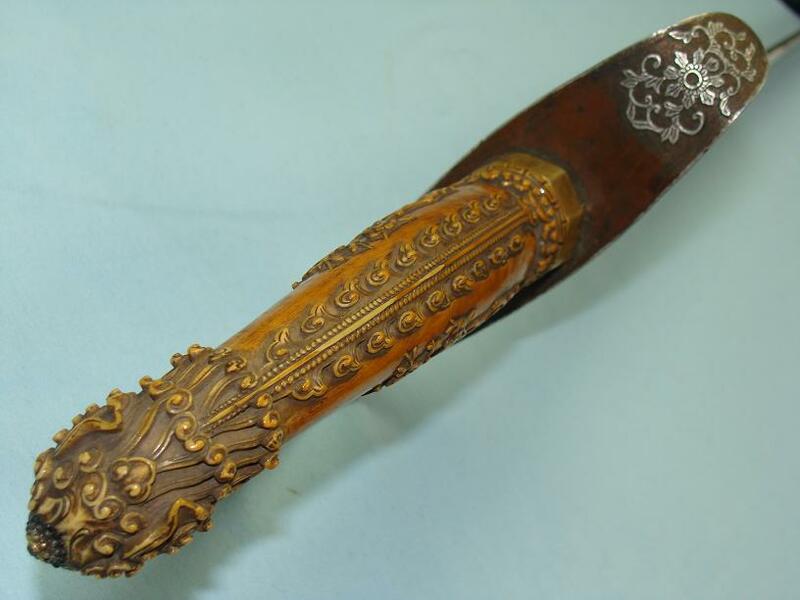 A very exotic form of a Guom displaying the finest work of many artisans.